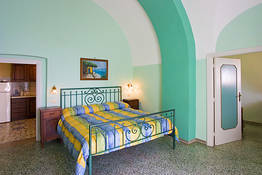 Sea view Apartment "La Rotonda"
As you open the door you enter into the vacation condominium's open living room, comfortably furnished.Adjoined to the living room is the bathroom and the fully equipped kitchen and off the kitchen is the terrace.The master bedroom is elegantly furnished with a most comfortable double bed, wardrobe, nightstand, a telephone (only for internal use), and two big bay windows to allow the Mediterranean Sea breeze cool you off. 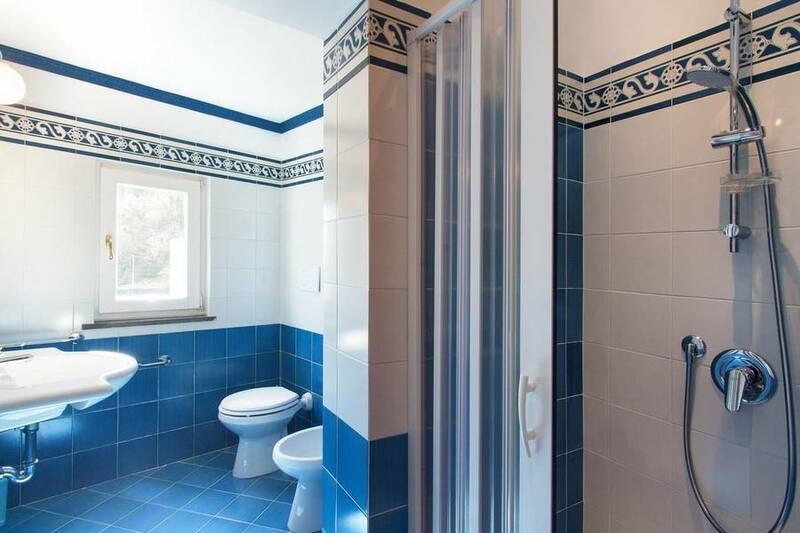 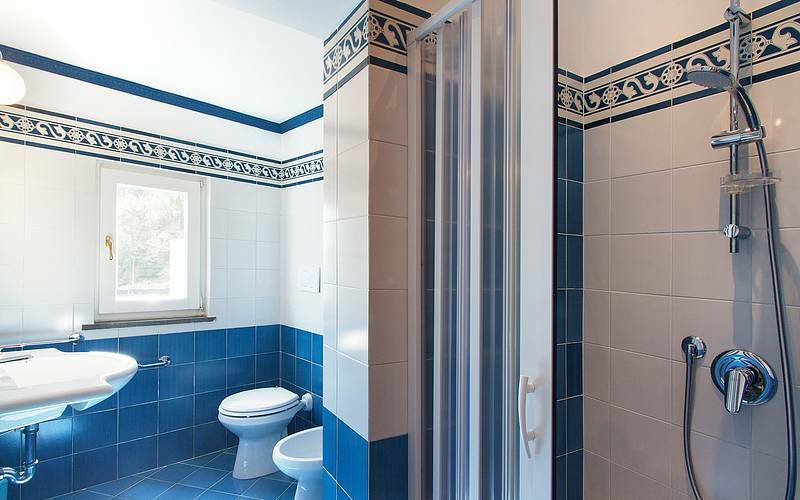 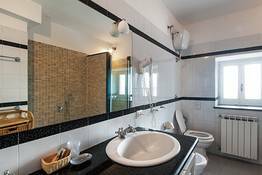 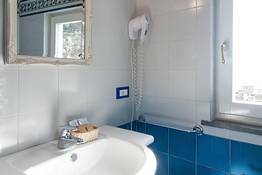 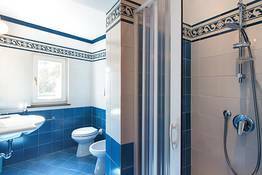 The tiled bathroom offers a stand-up shower with detachable shower-head, full size sink, mirror, toilet, and bidet.Personalized air conditioning and heating, the Breakfast ON REQUEST are available at extra charge. 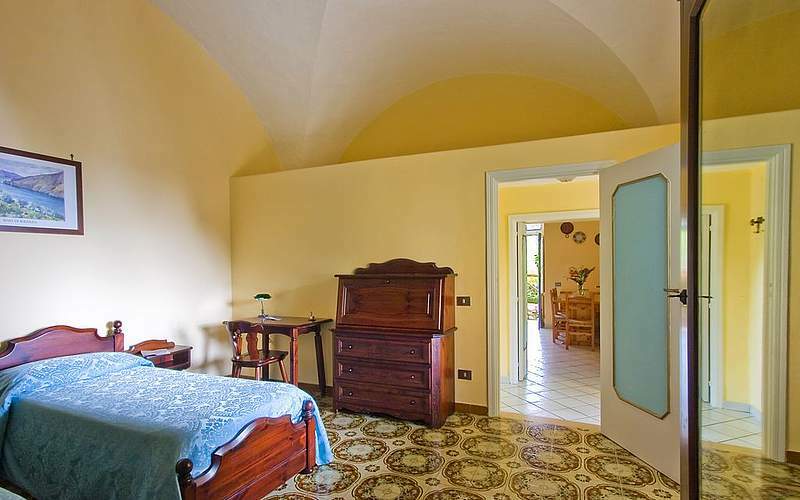 This intimate double room with attached private bathroom sits atop the property and has a fantastic pool view. 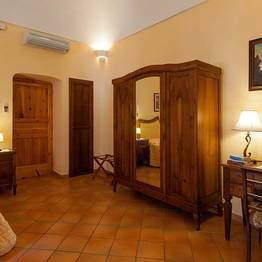 Complete with a most comfortable double bed, night stand, wardrobe, drawers, air conditioning, telephone (for internal use only), TV, and CD radio, L'Isca is the perfect room for a truly privileged, high quality, romantic getaway. 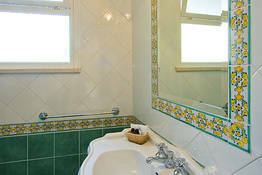 The tiled bathroom has a stand-up shower with detachable shower-head, full size sink, mirror, toilet, and bidet. 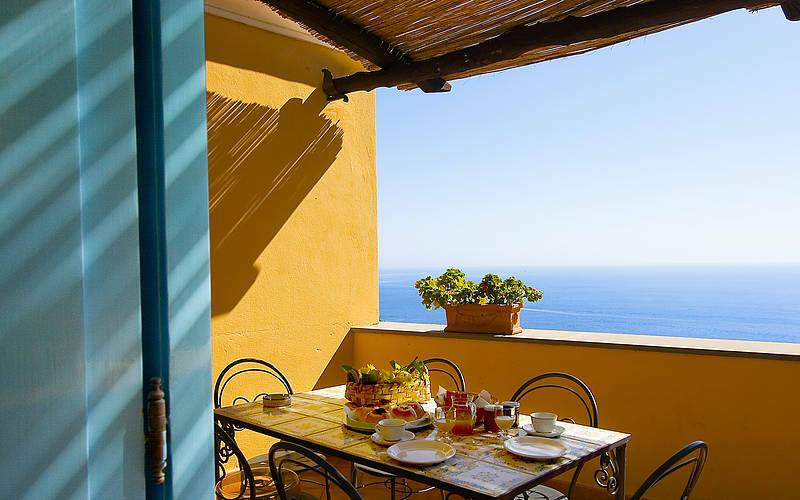 Personalized air conditioning and heating, the Breakfast ON REQUEST are available at extra charge. 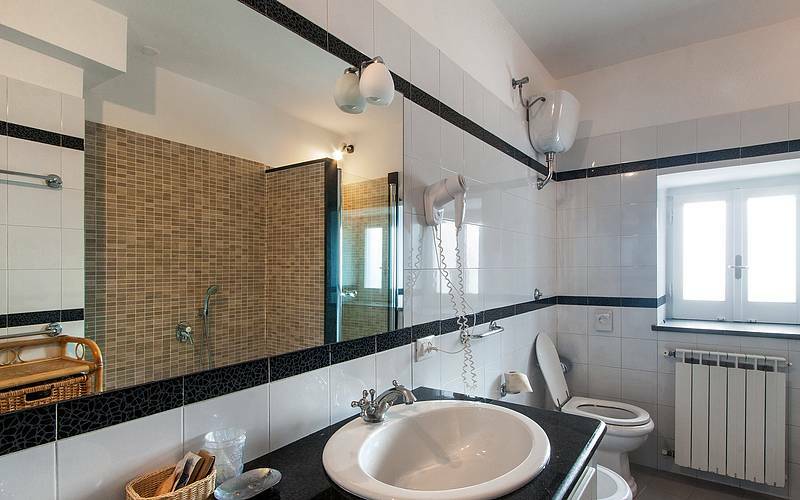 Exclusive two-bedroom condominium. 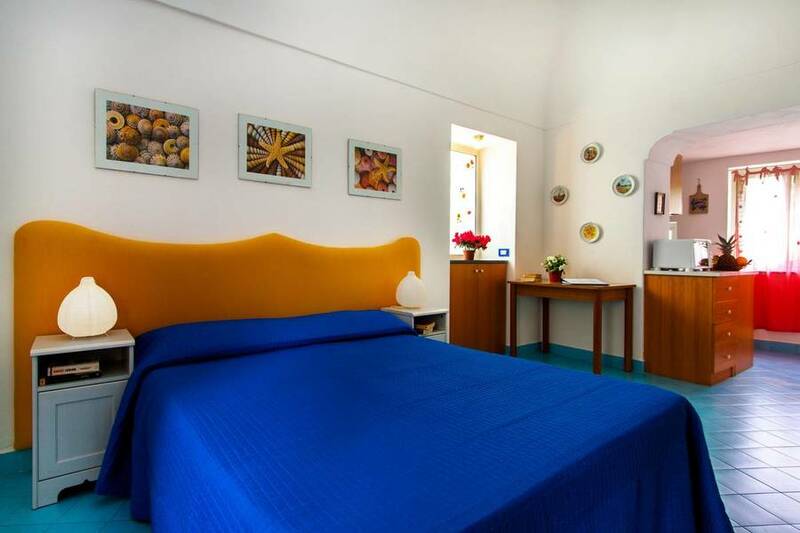 The first twin room is comfortably furnished with two single beds, nightstands, wardrobe, and TV. The master bedroom comes complete with a double bed, large wardrobe, drawers, sofa, and nightstands. 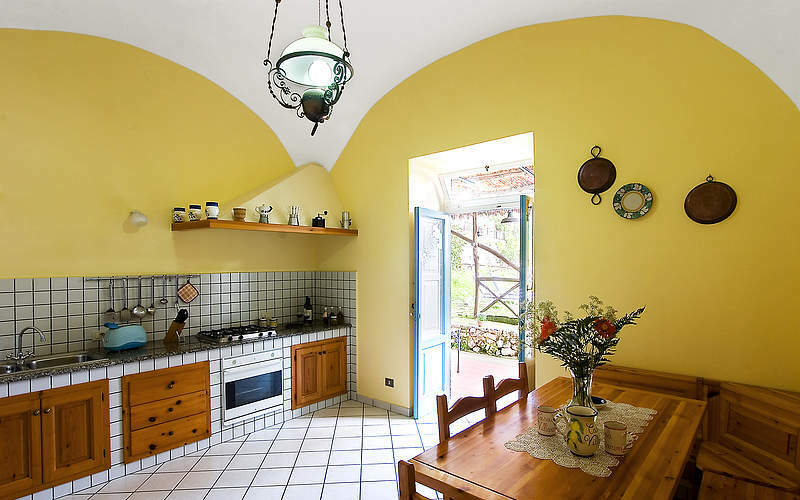 In the fully equipped kitchen you can cook up your favorite dishes with the four-burner stove and oven, while sitting at the dining table for eight. 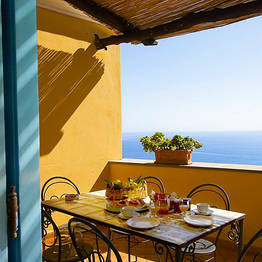 If you wish, you can even enjoy your meal at the outdoor dining table on your own private sea view patio. 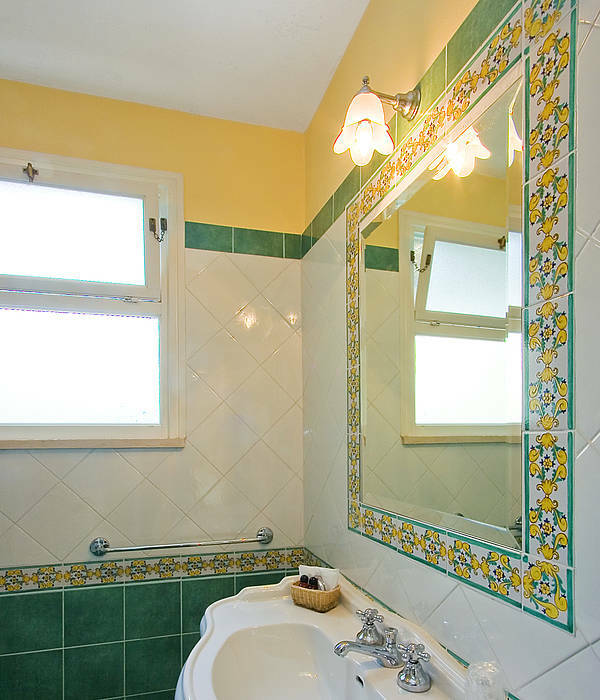 The tiled bathroom offers a stand-up shower with detachable showerhead, full size sink, mirror, linen drawers, toilet, and bidet. 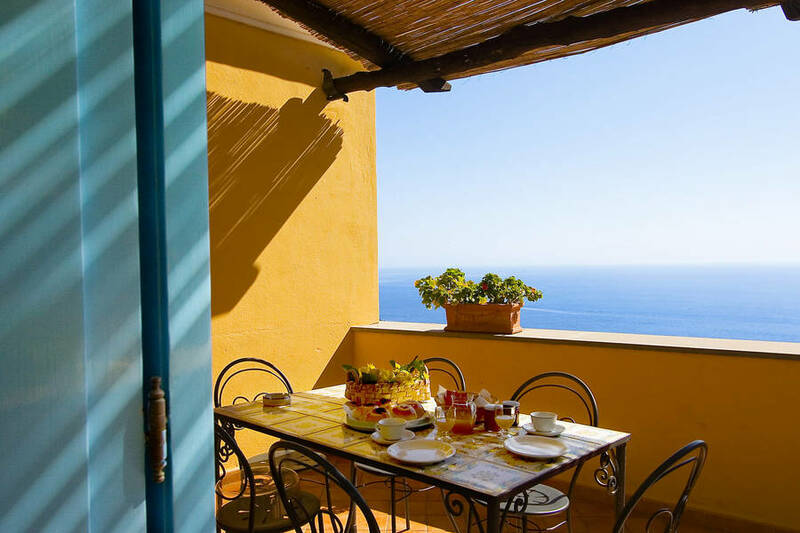 Exclusive two-bedroom condominium for up to four guests that offers stunning sea views from both of its bedrooms. 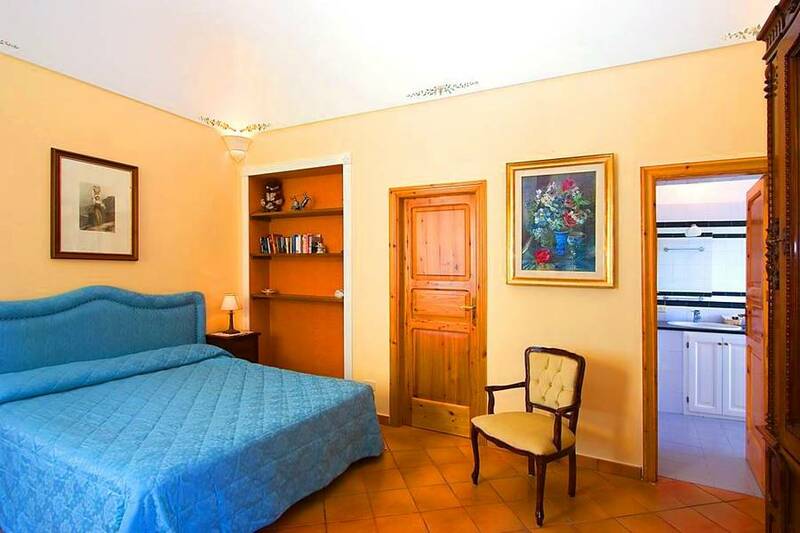 From the master bedroom, you can gently fall asleep and wake up with the view of the Mediterranean Sea at the foot of your bed. 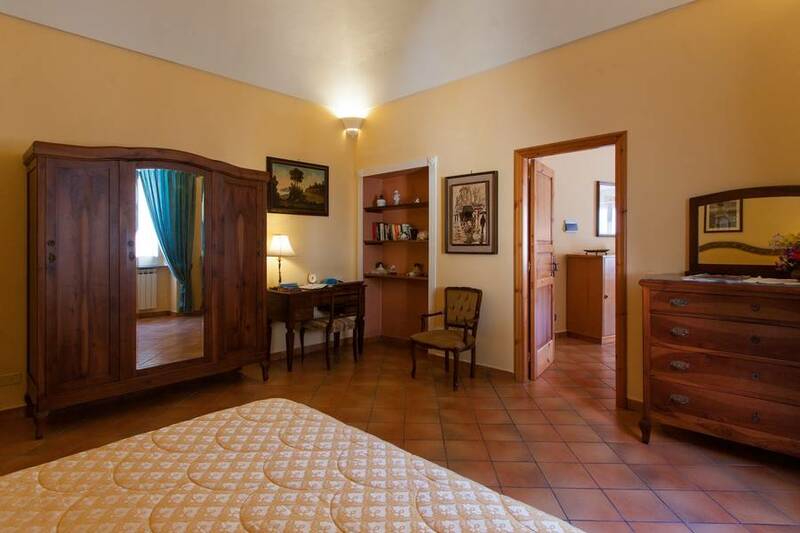 This spacious room comes complete with a TV and wardrobe. 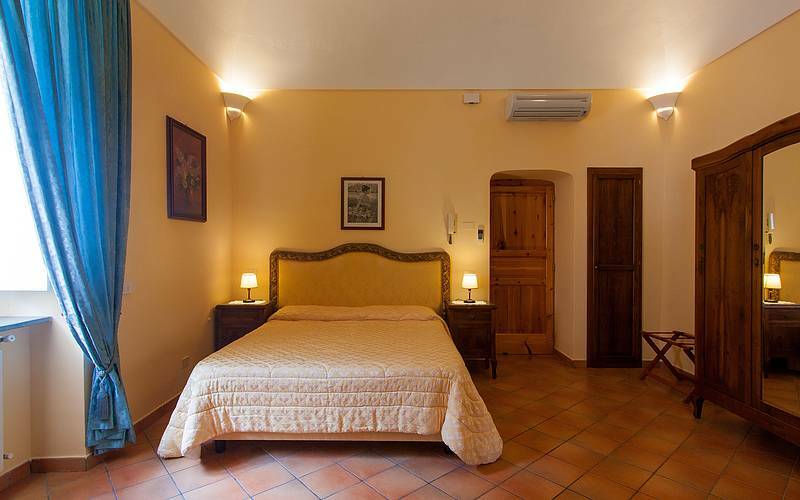 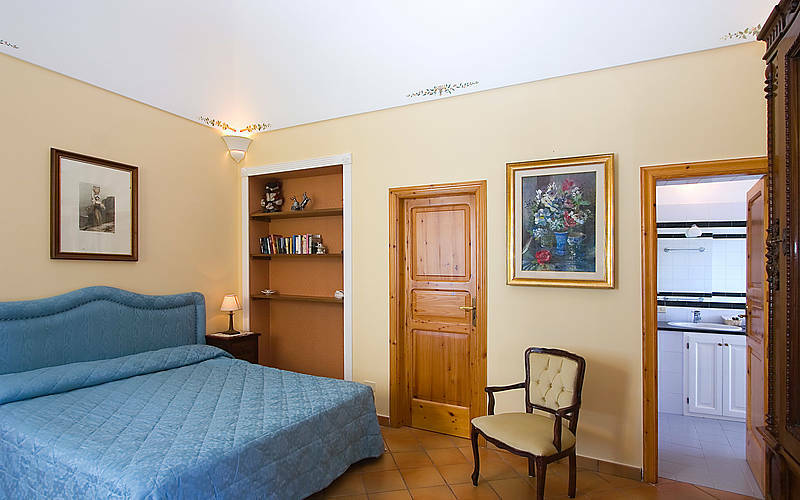 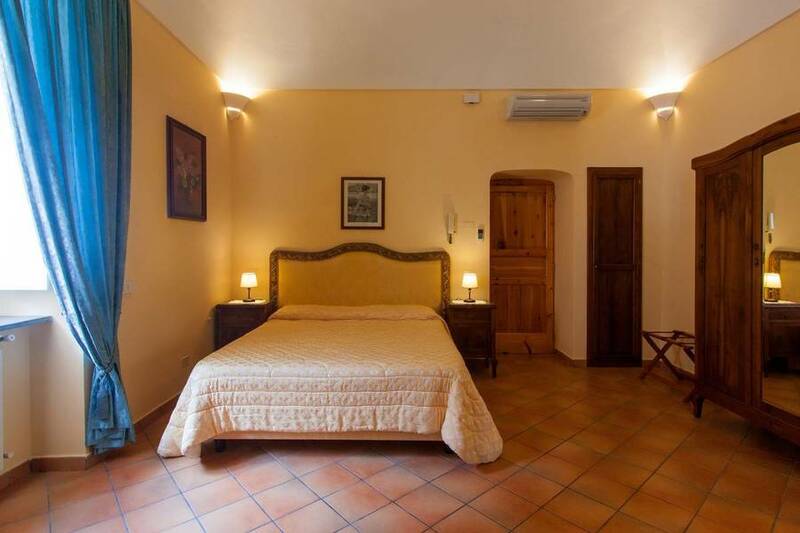 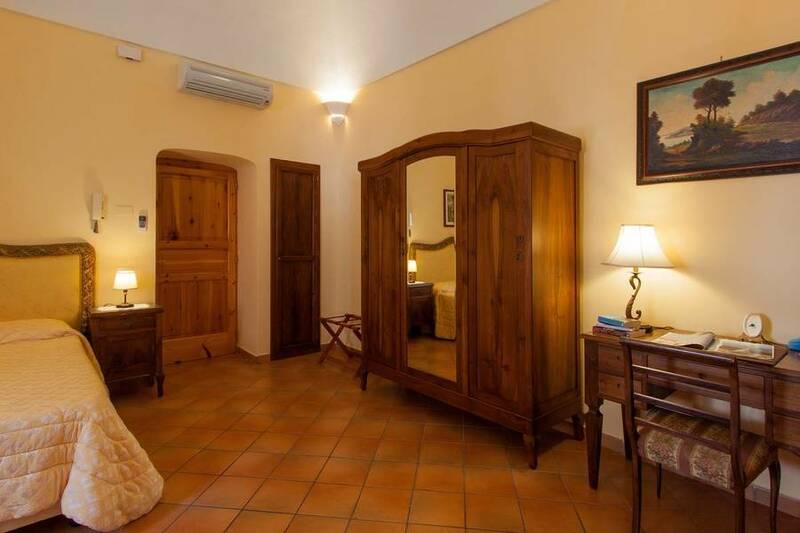 The twin bedroom, which is just off the master bedroom, is furnished with two single beds. 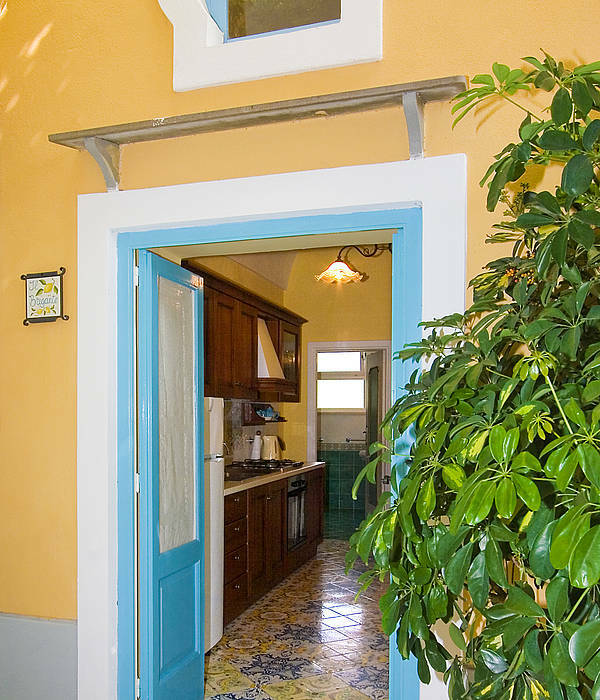 Fully-equipped kitchen, with four refrigerator/freezer stove and oven, refrigerator and freezer, coffee maker, and dining table. 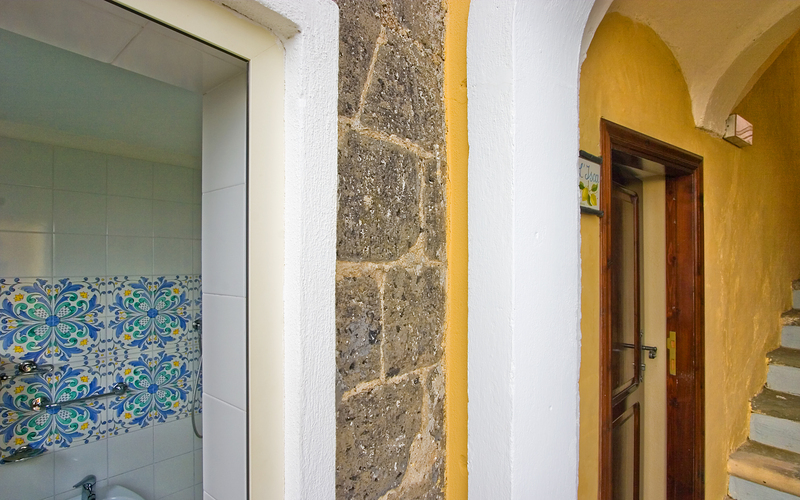 The tiled bathroom offers a stand-up shower with detachable showerhead, full size sink, mirror, toilet, and bidet. 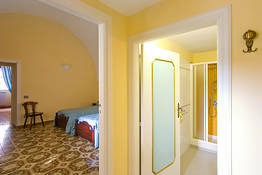 From your private entrance,you step into the living room of "La Vetara. 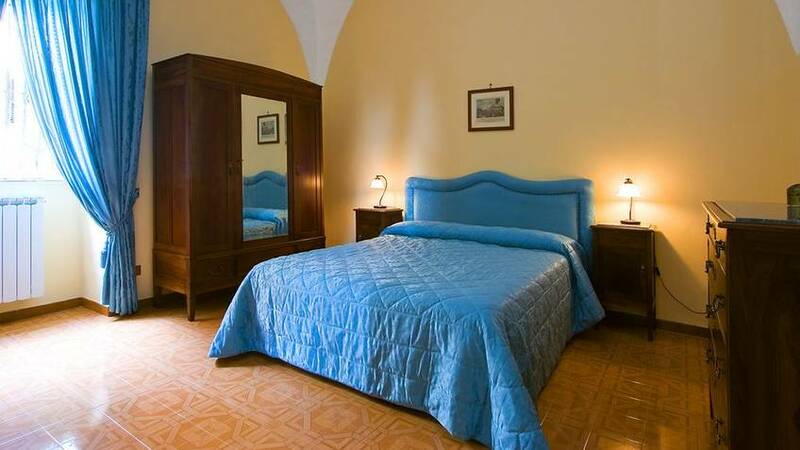 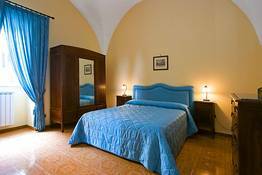 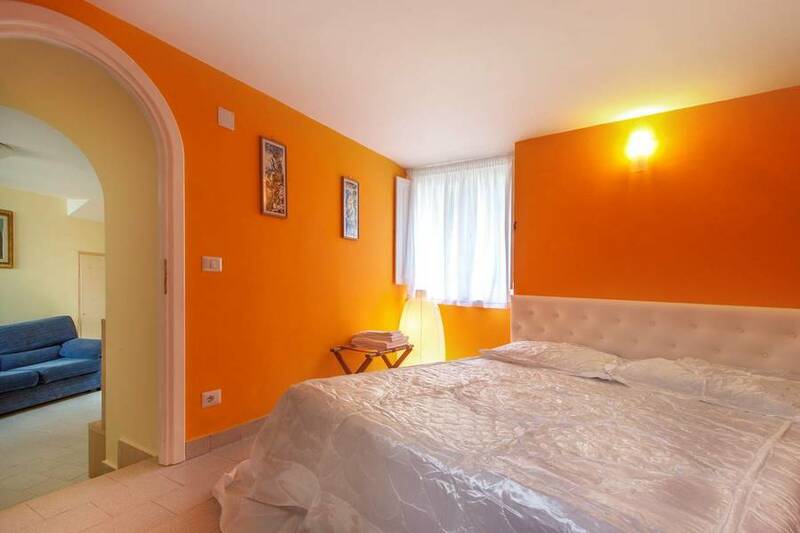 "The first bedroom is professionally furnished with two comfortable single beds. 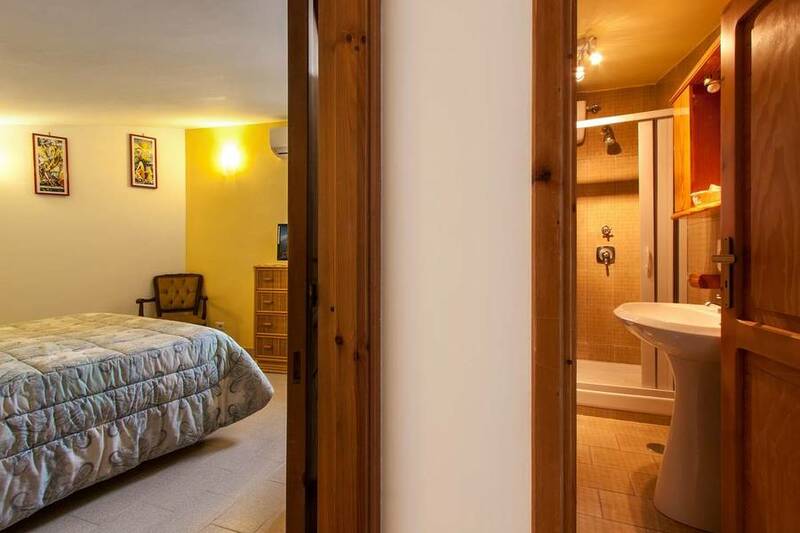 The connecting bathroom in this bedroom offers a stand-up shower with detachable showerhead, full size sink, mirror, toilet, and bidet.The master bedroom is also professionally furnished with a most comfortable double bed, television, beautiful large wardrobe, nightstand, and bookshelves.The connecting bathroom provides you with a large bathtub with detachable showerhead, stand-up shower, two full , large wall mirror, toilet, and bidet. 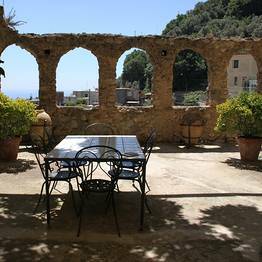 Sea view private area with patio set for four. 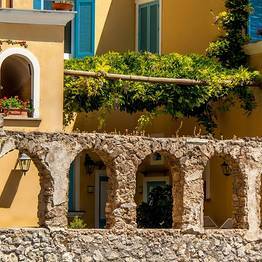 Nerano is a tiny fishing village outside Massa Lubrense on the coast between Sorrento and the Amalfi Coast. 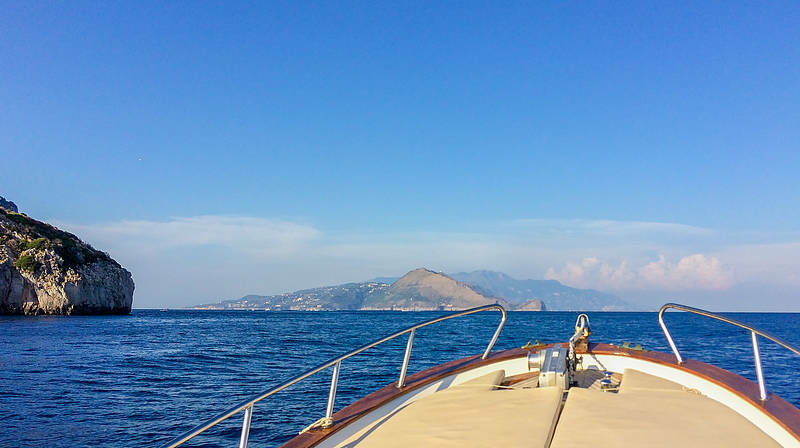 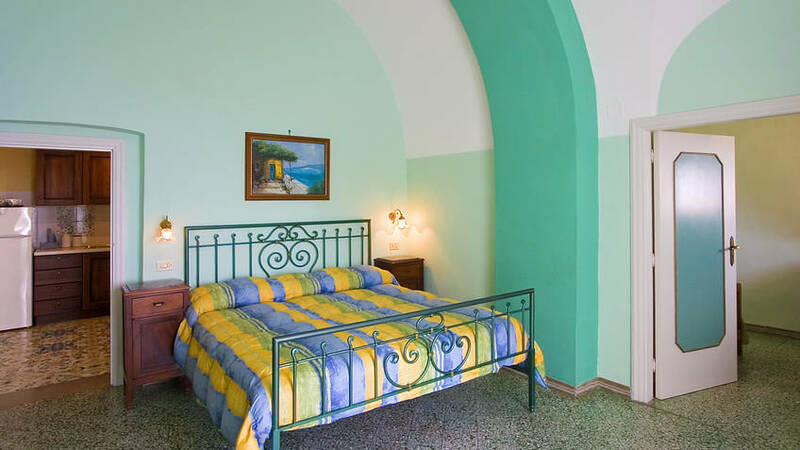 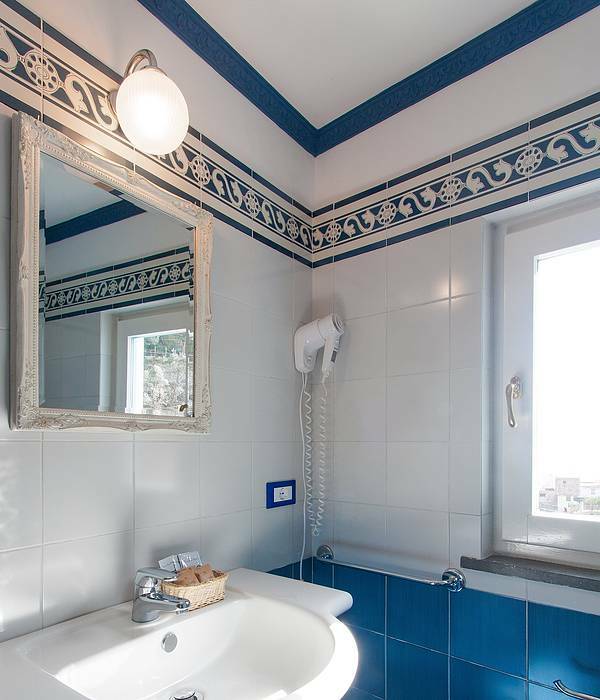 It was here that the Marquis of Villarena established his historic residence, a lovely villa which is now Relais Villarena, where travellers to this magical coast spend an unforgettable vacation on Italy's Bay of Naples. 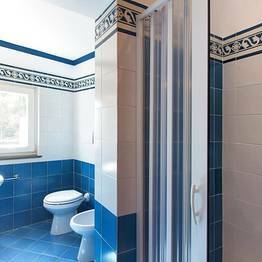 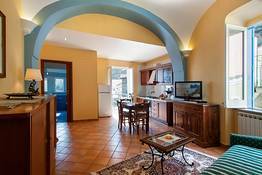 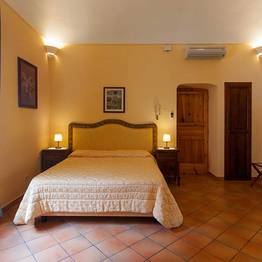 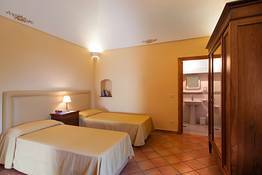 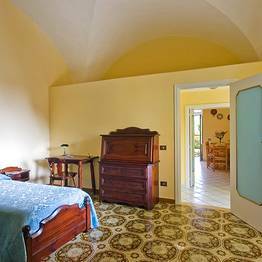 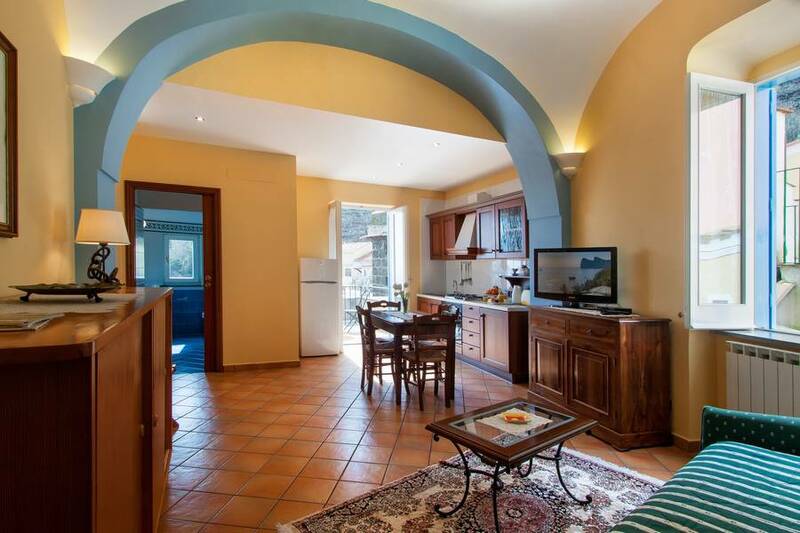 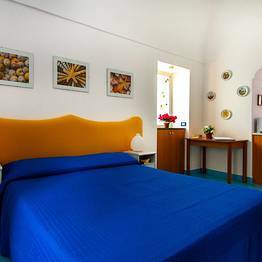 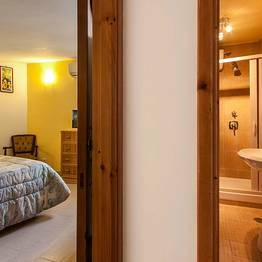 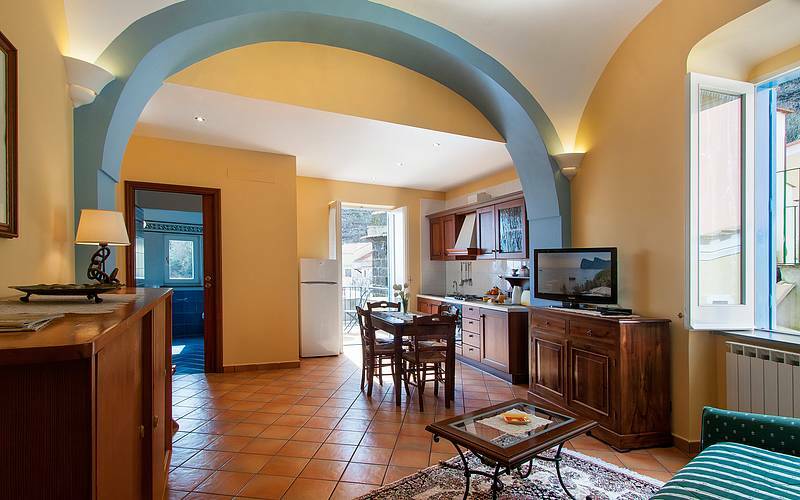 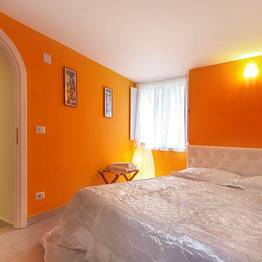 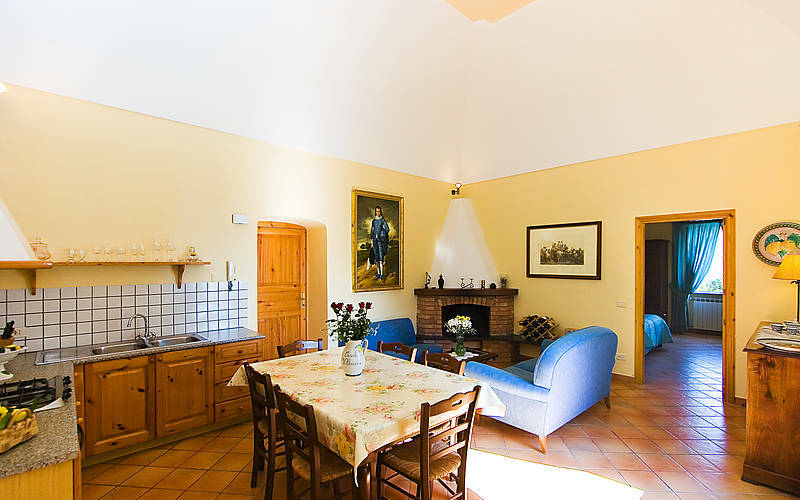 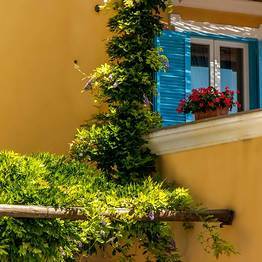 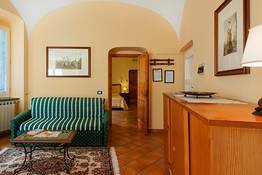 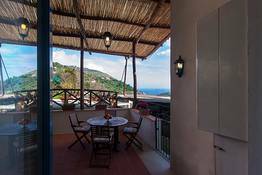 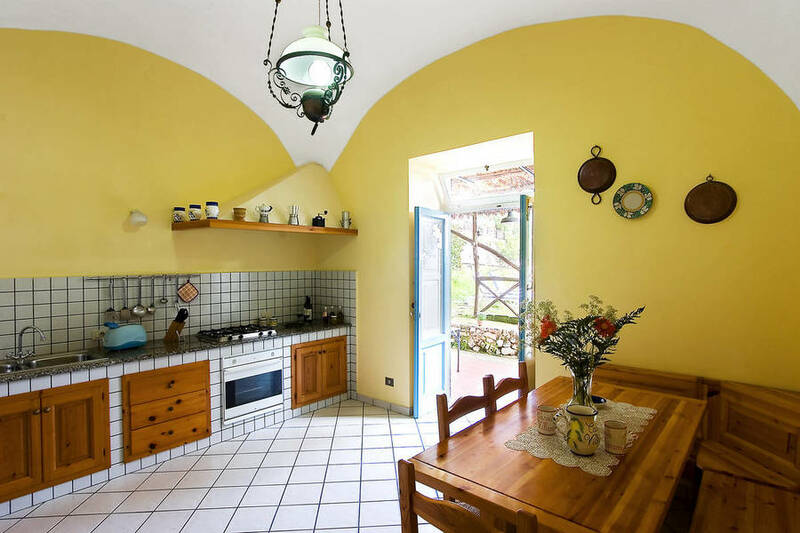 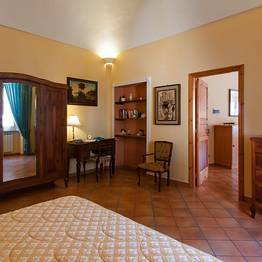 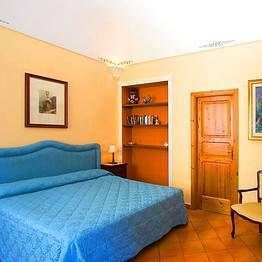 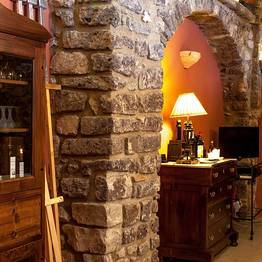 La Rotonda, Il Gallo Lungo, La Vetara, Il Brigante, L'Isca: these are the pretty Relais Villarena holiday apartments with all the comforts of home. 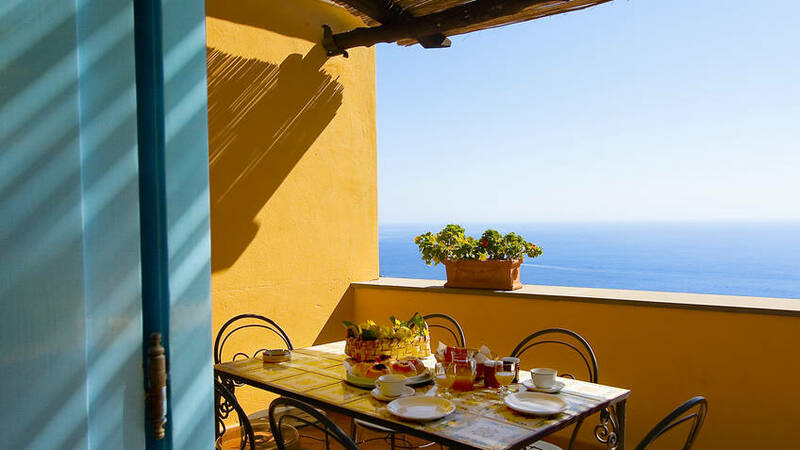 Each apartment has a living area with a kitchenette, a breathtaking private terrace facing the sea and the romantic Li Galli islets, and direct access to the garden. 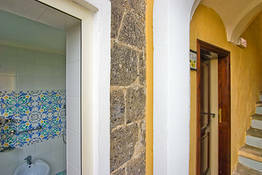 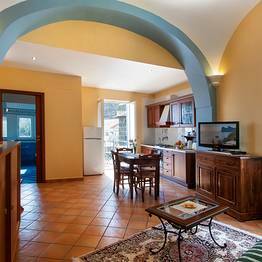 Villarena also has two annex apartments, for travellers looking for added privacy during their stay. 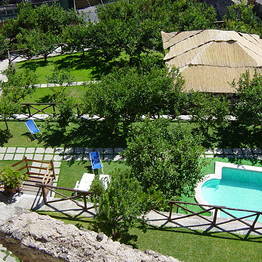 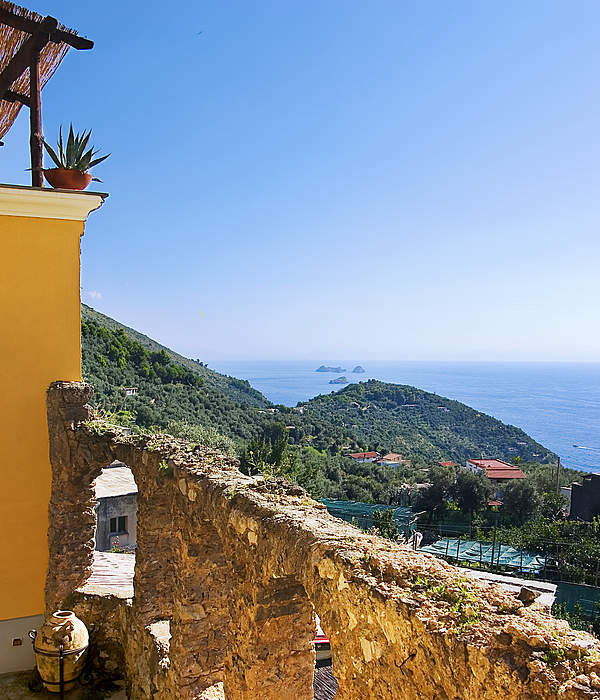 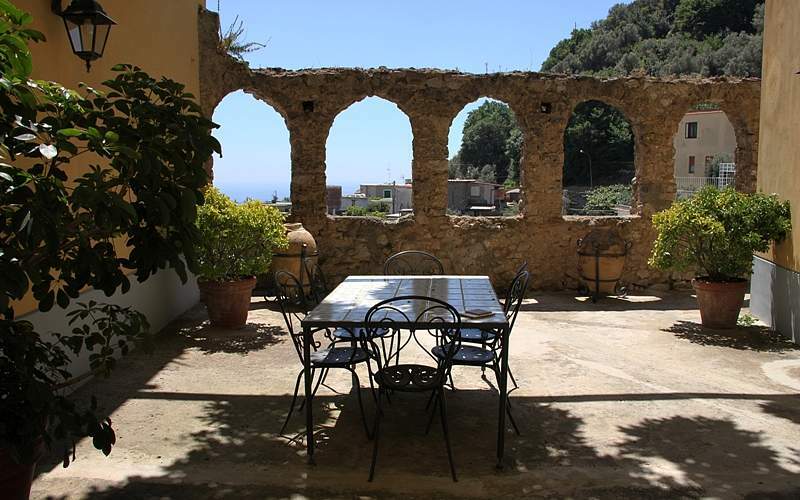 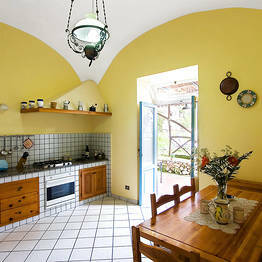 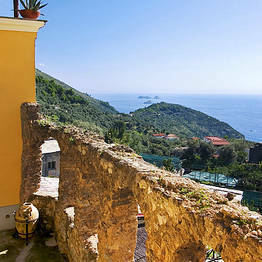 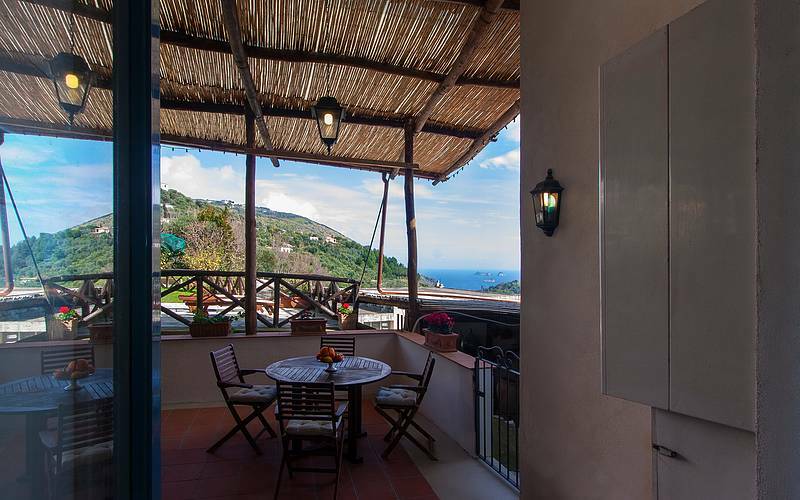 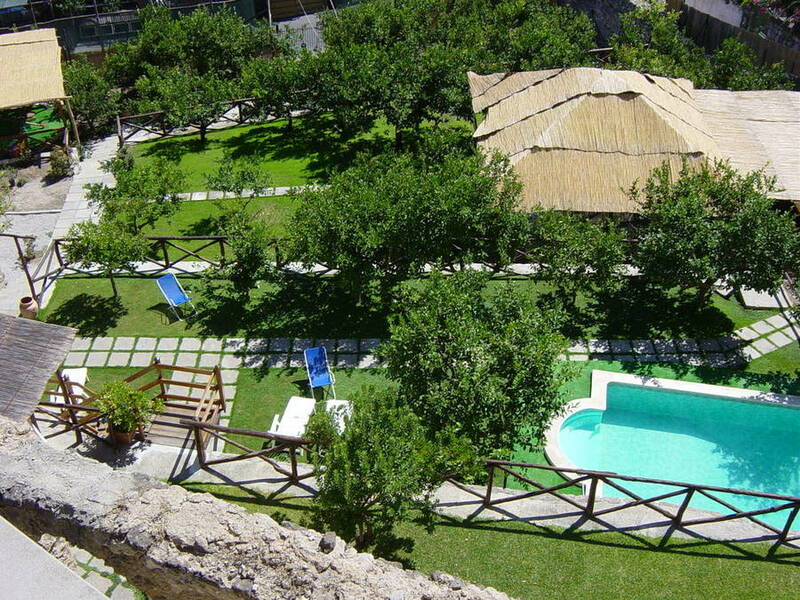 The villa includes a traditional terraced garden so common along the steep coastline of the Sorrentine Peninsula. 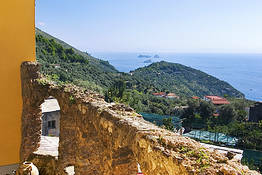 Each terrace holds a unique surprise, including the outdoor pool and hot tub, the sundeck overlooking the sea, and, for those curious to sample the local specialities, the gourmet terraces - one with a tasting room for local products and another with the restaurant tucked under the shade of the lemon grove. 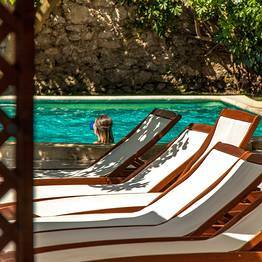 In just a few minutes, guests can walk to the Nerano beach to relax at the water's edge and take a dip in the Mediterranean. 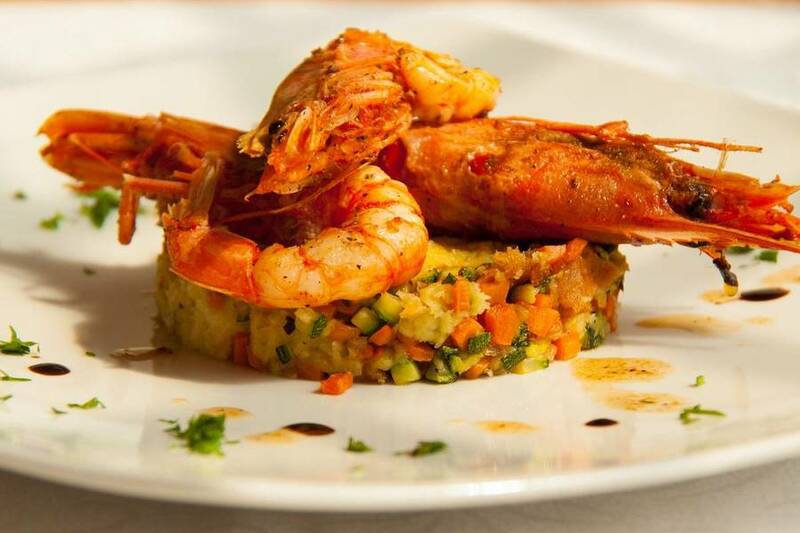 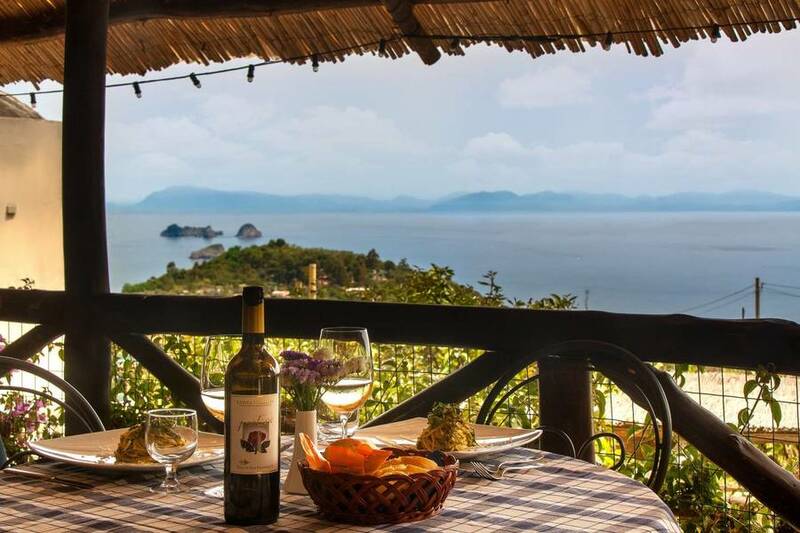 With the sweet scent of lemon blossoms, the view of the sea, and the excellent traditional cuisine, the villa's Dolce far Niente restaurant is the perfect spot for an unforgettable meal. 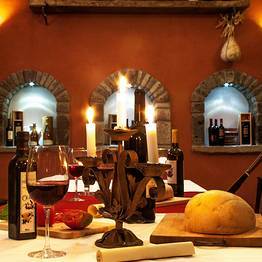 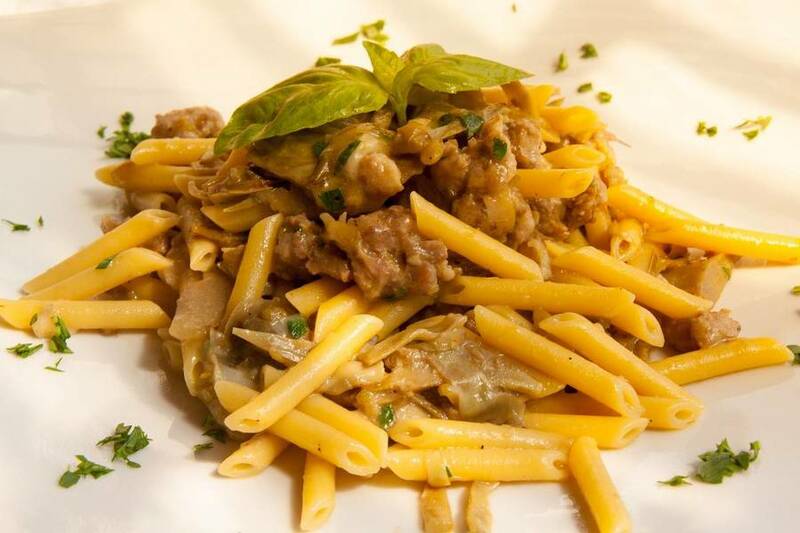 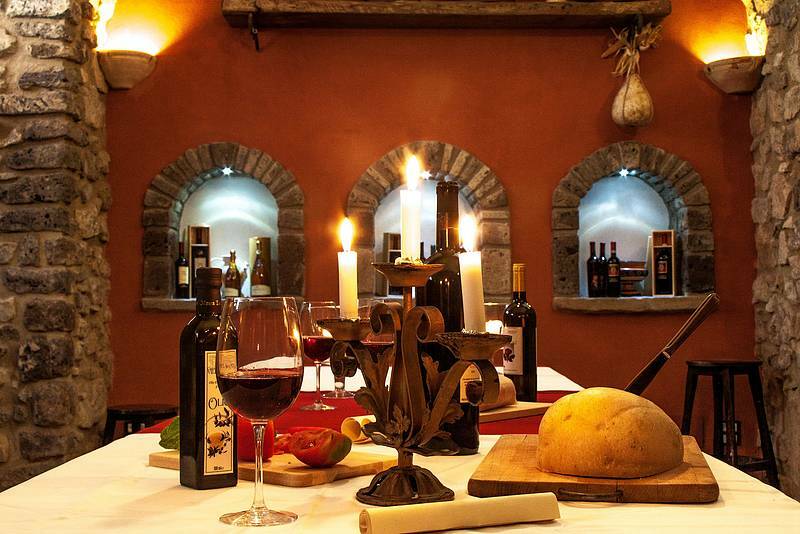 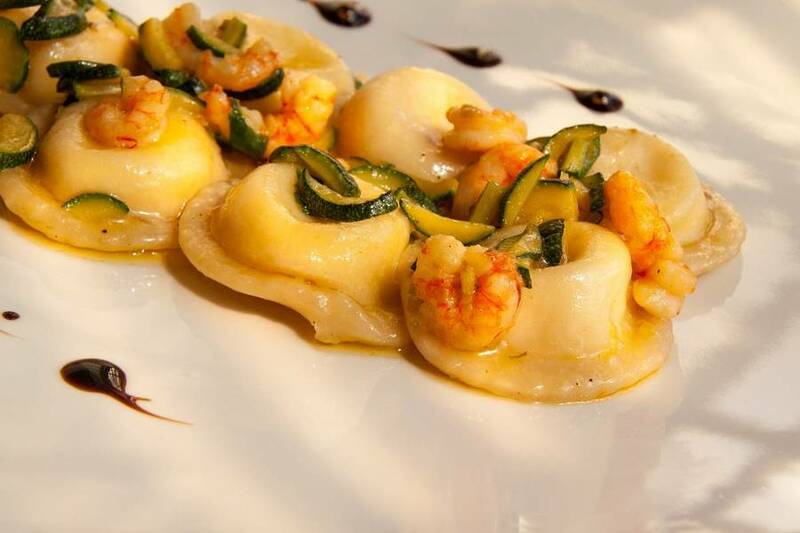 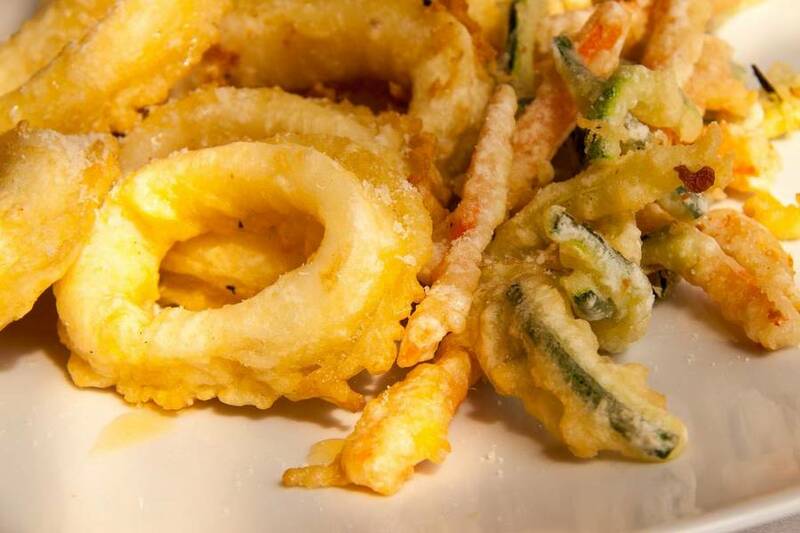 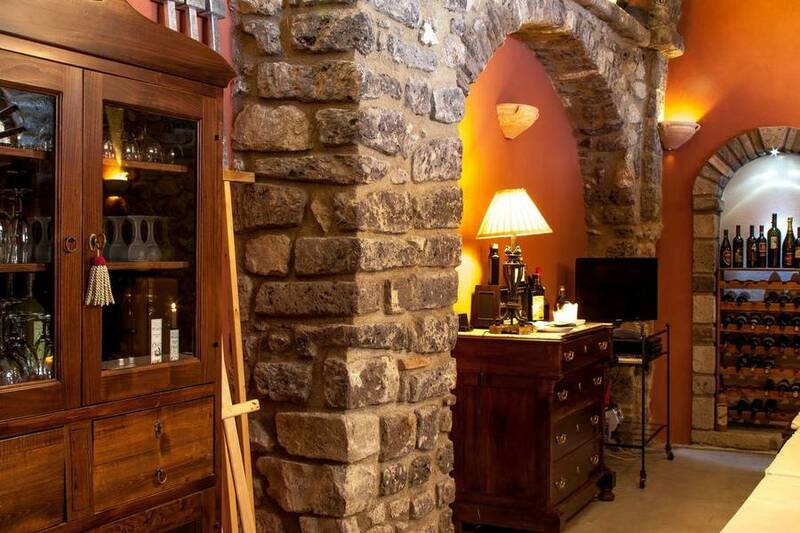 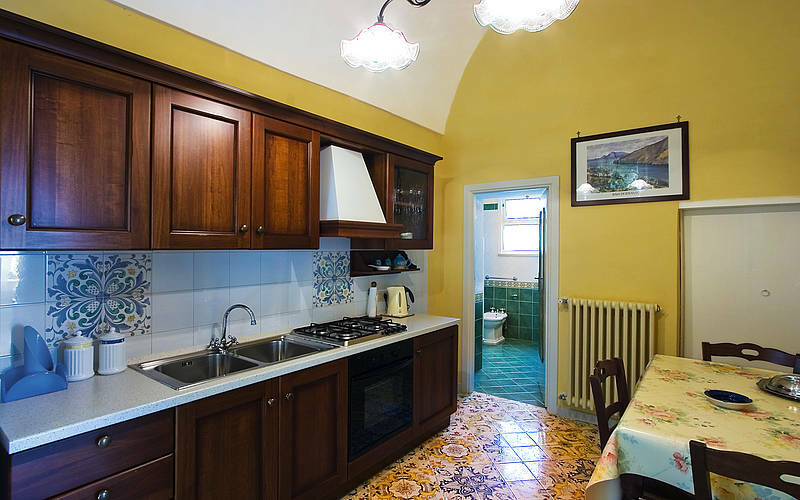 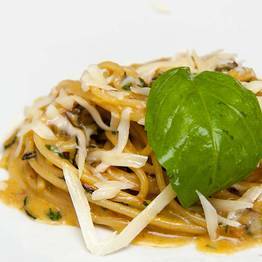 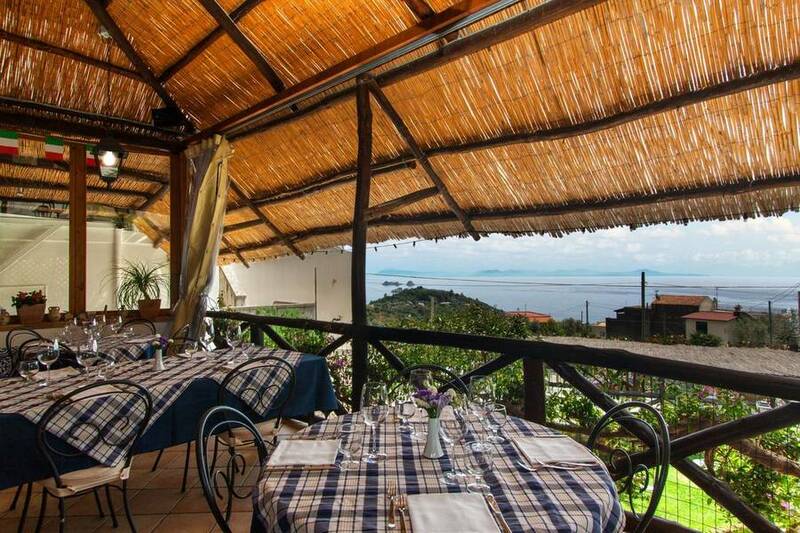 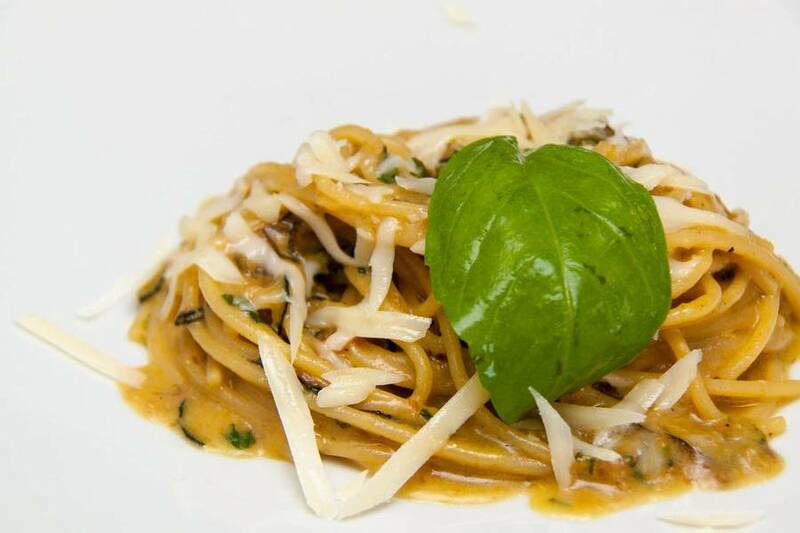 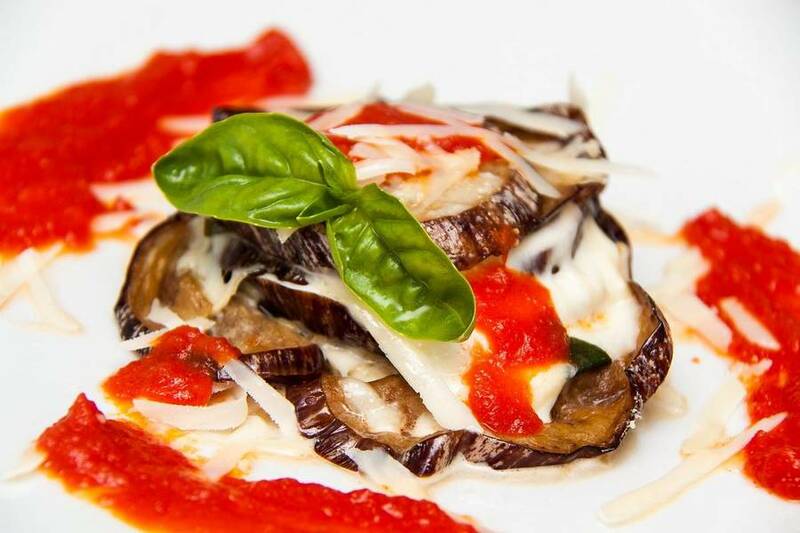 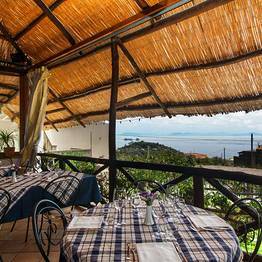 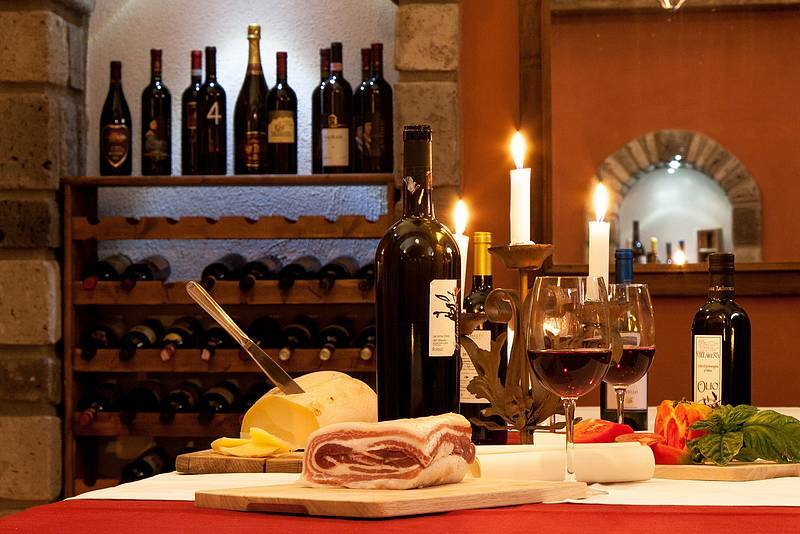 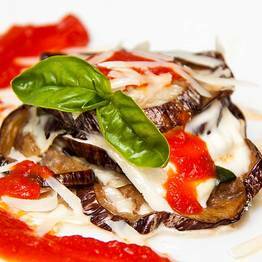 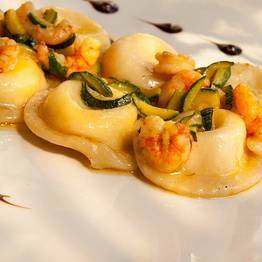 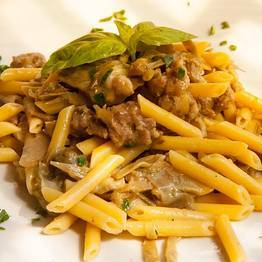 Guglielmo, your host, will help you select from the house specialties: paccheri pasta tossed with seafood, "spaghetti alla Nerano", and other traditional dishes. Villarena is also an organic farm and guests are invited to sample the villa's own products including jams and olive oil. 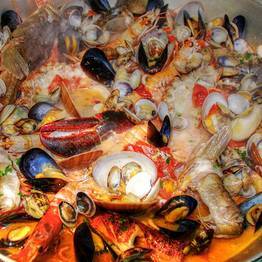 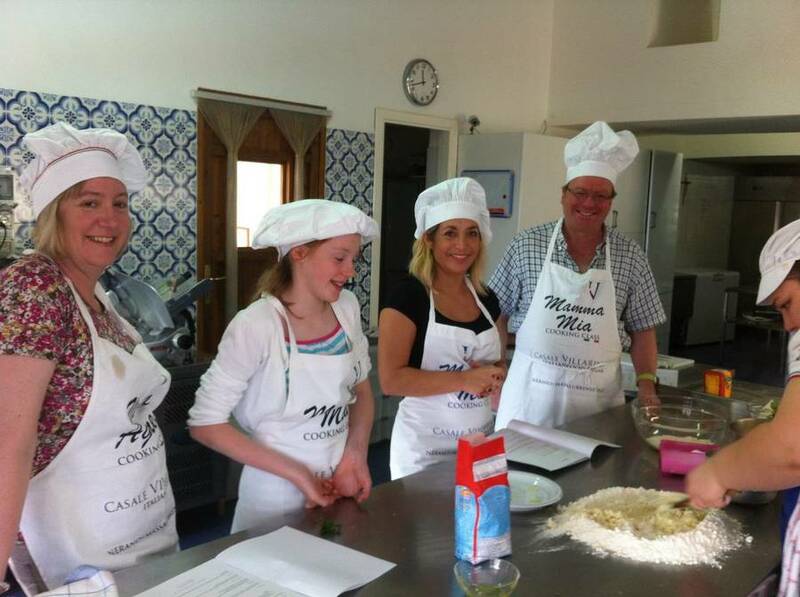 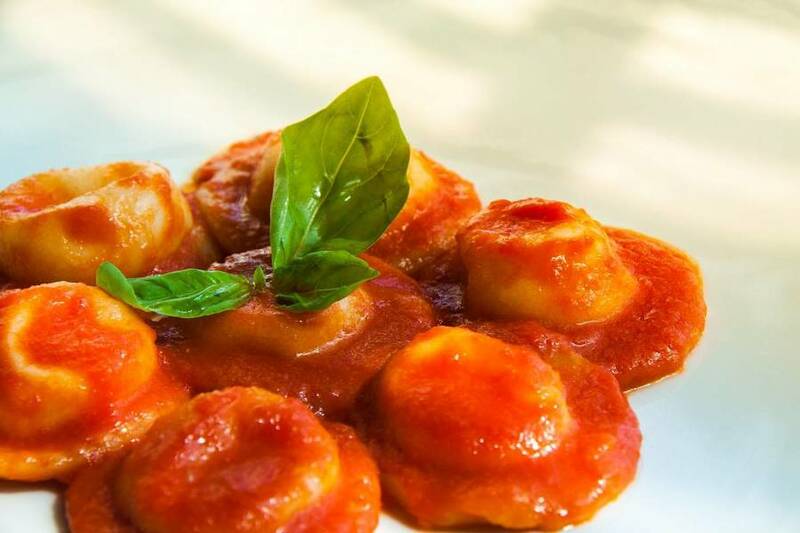 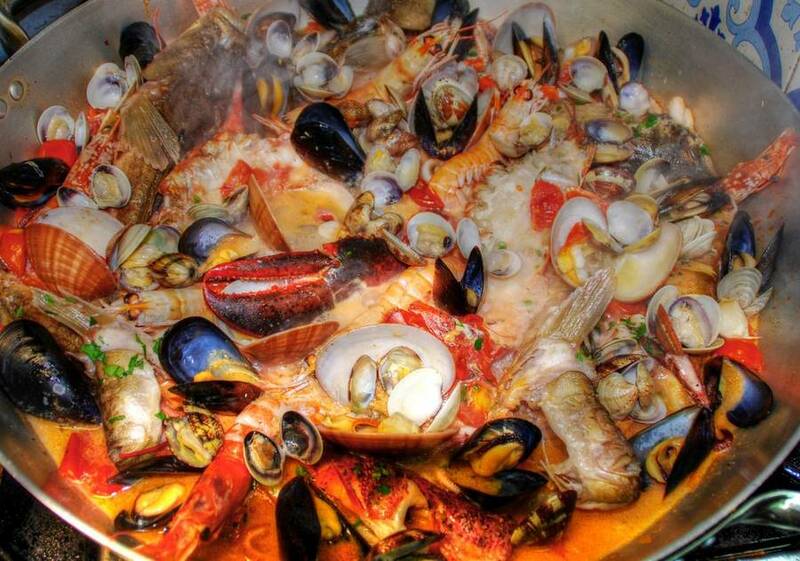 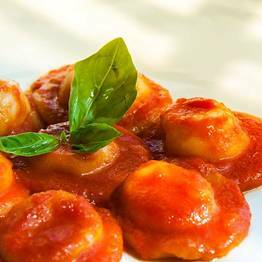 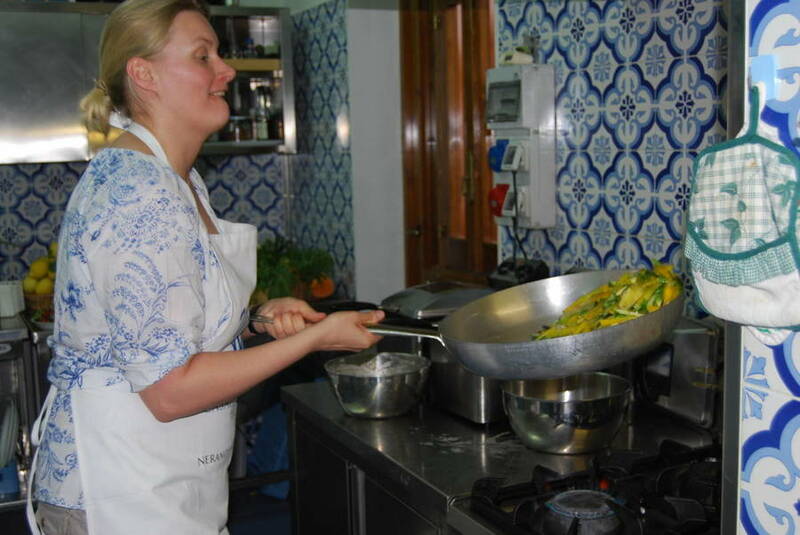 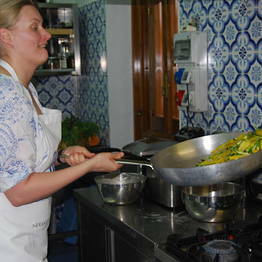 "Mamma Mia" is the villa's cooking class which can be organized individually or for an entire groups at Villarena for those who want to learn how to prepare the local dishes...the hands-on lesson is followed by a meal made from what you have prepared! 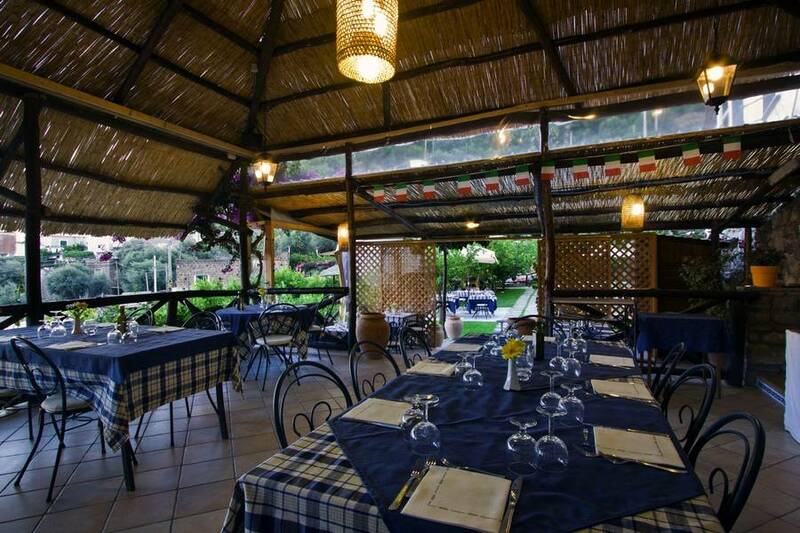 The Dolce Far Niente restaurant is perfect for events and special celebrations, including weddings, receptions, and private parties. 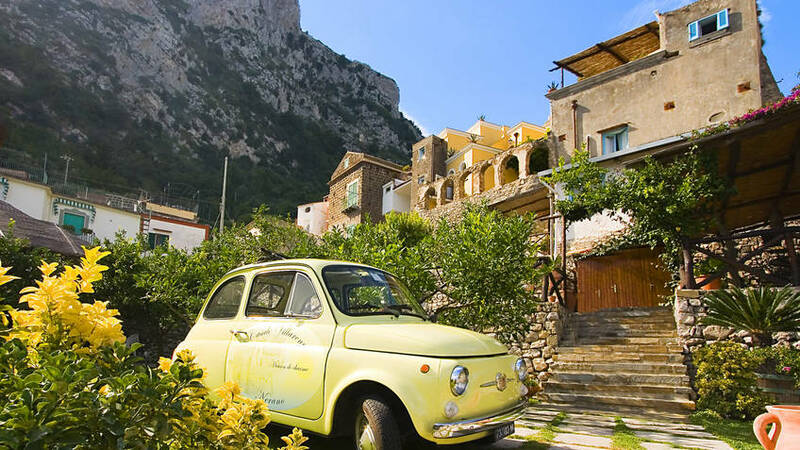 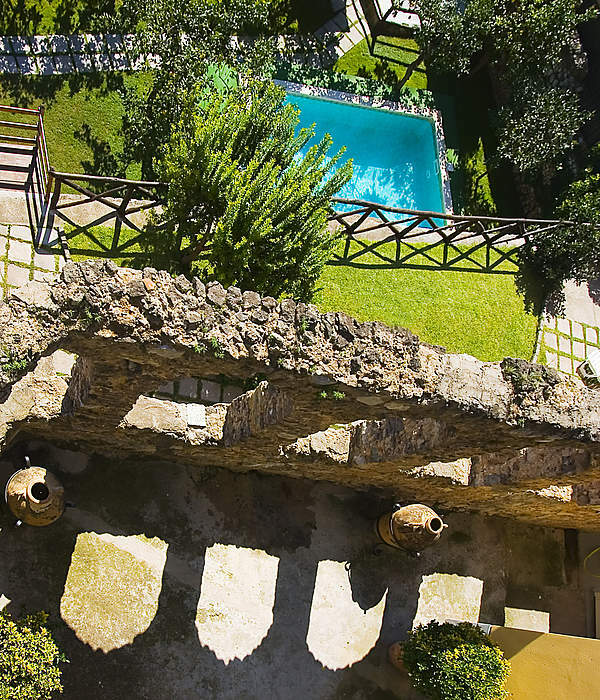 The breathtaking view over the Sorrento Peninsula, the intimate and romantic atmoshpere, are the scent of the surrounding citrus grove form the perfect backdrop for fairytale celebrations. 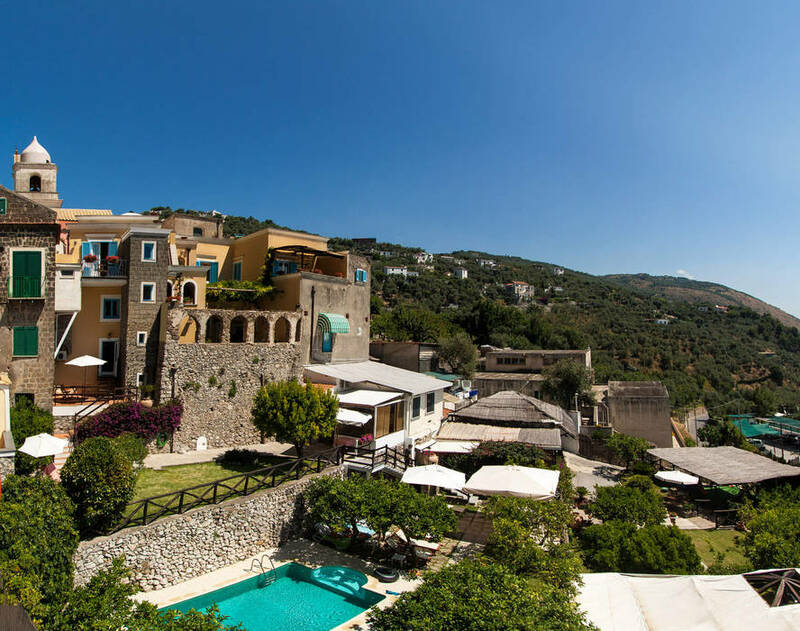 The Relais Villarena is a popular venue for destination weddings on the Sorrento Coast. 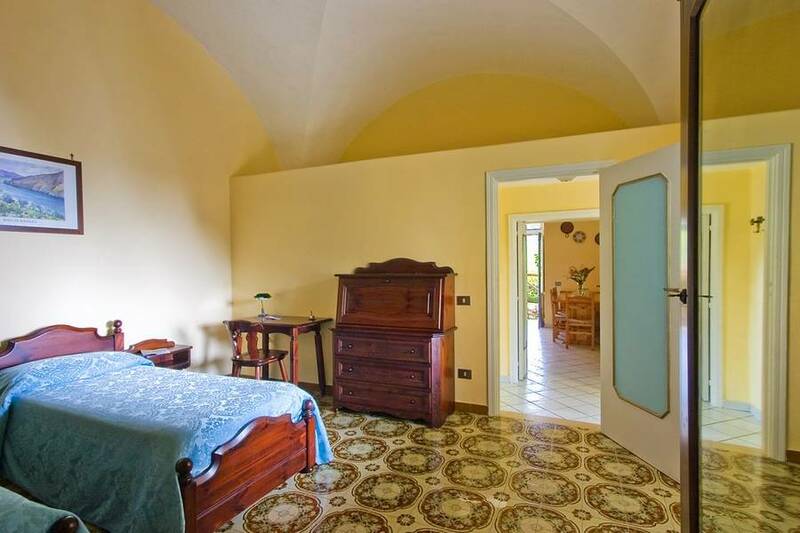 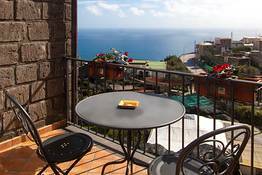 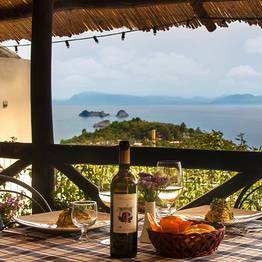 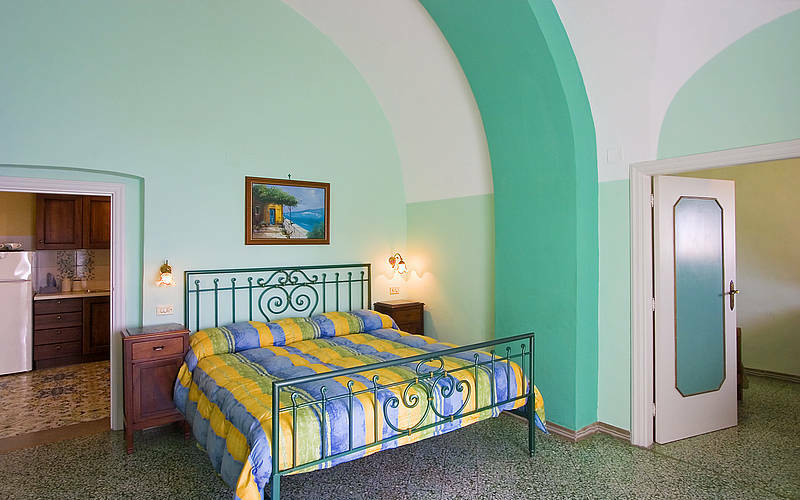 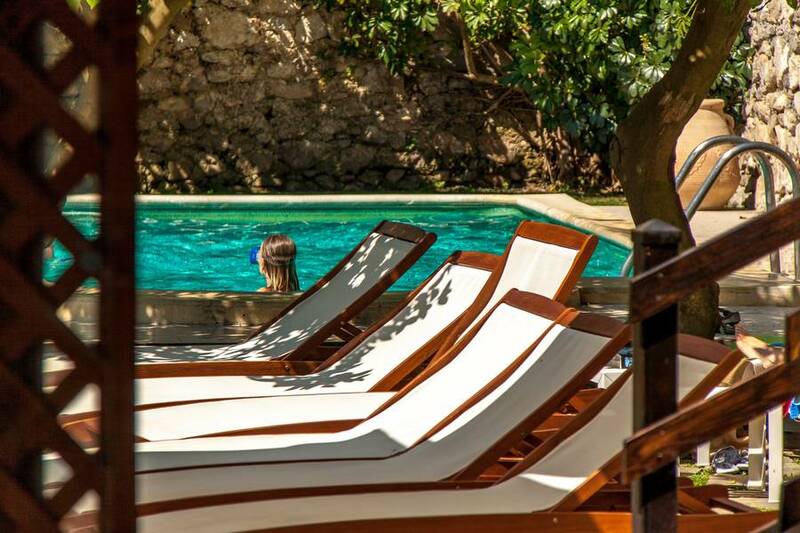 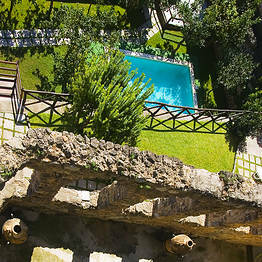 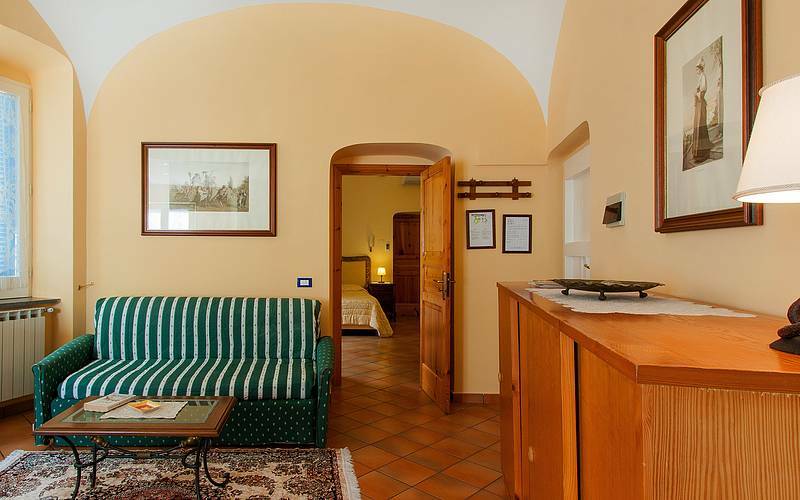 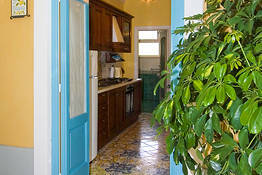 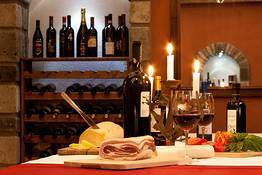 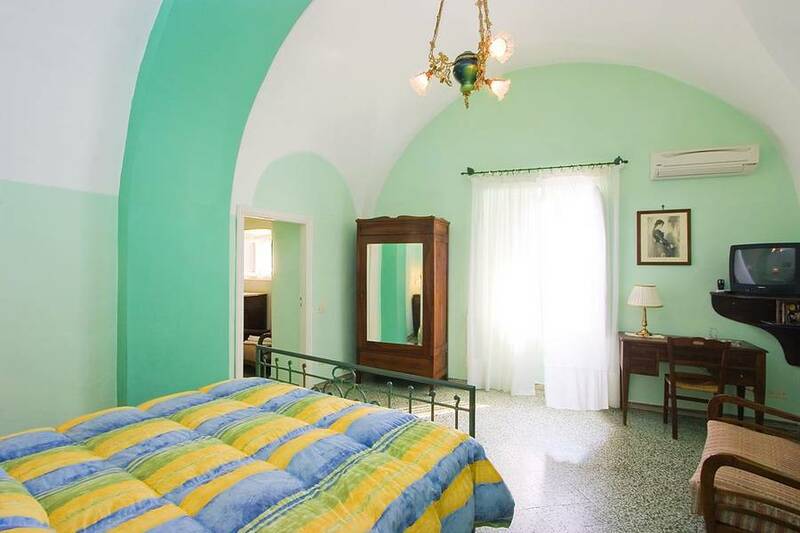 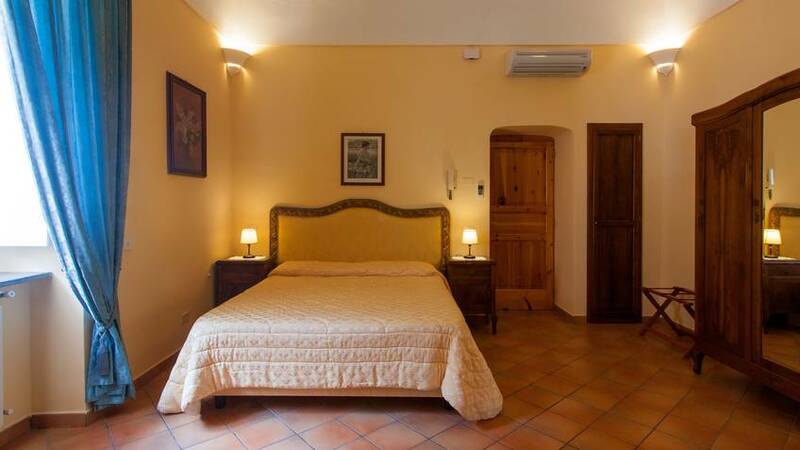 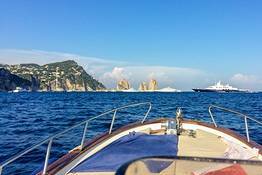 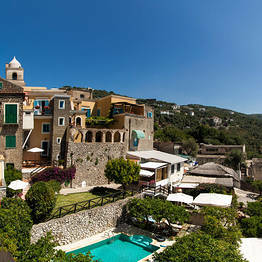 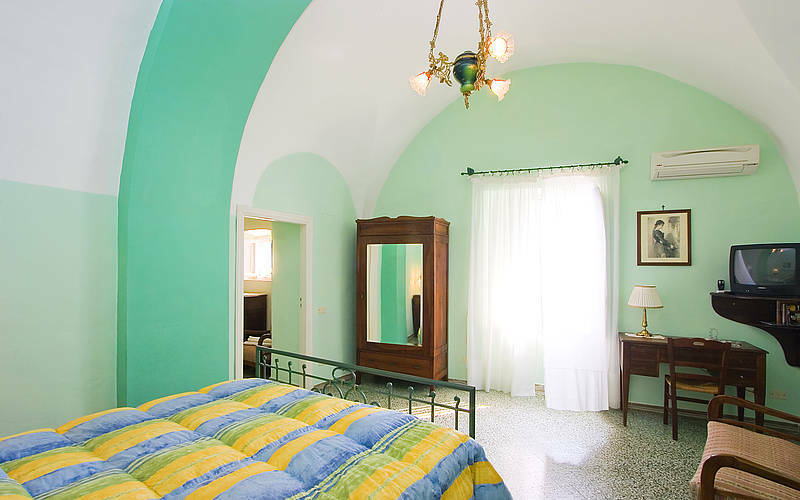 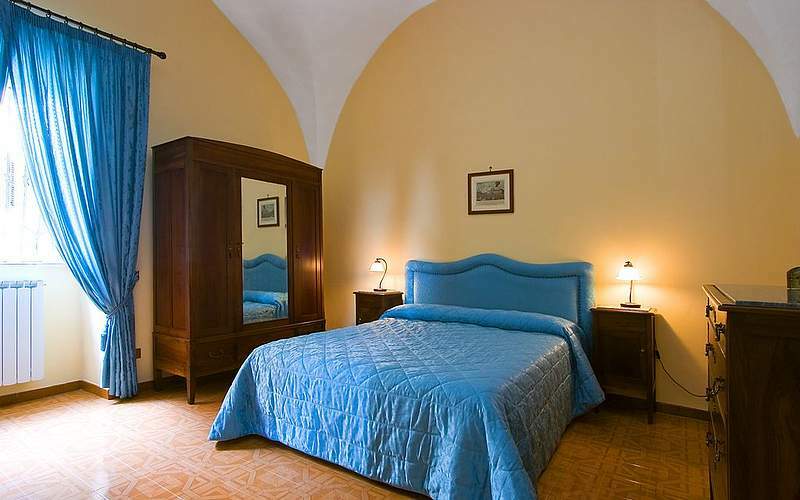 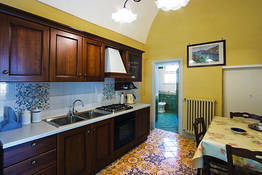 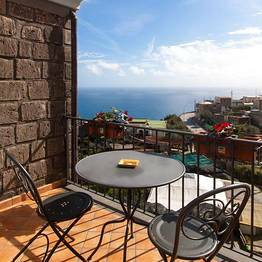 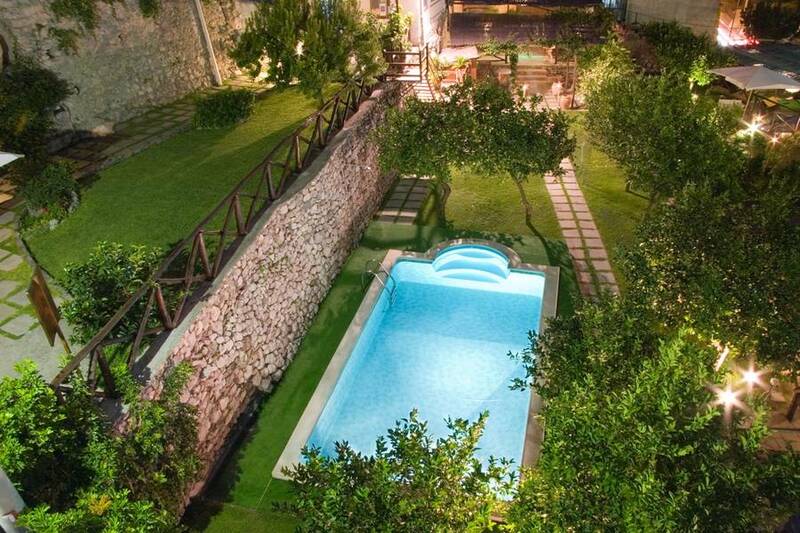 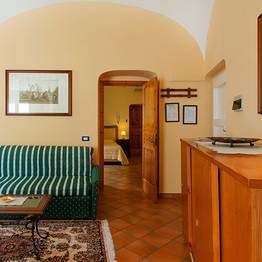 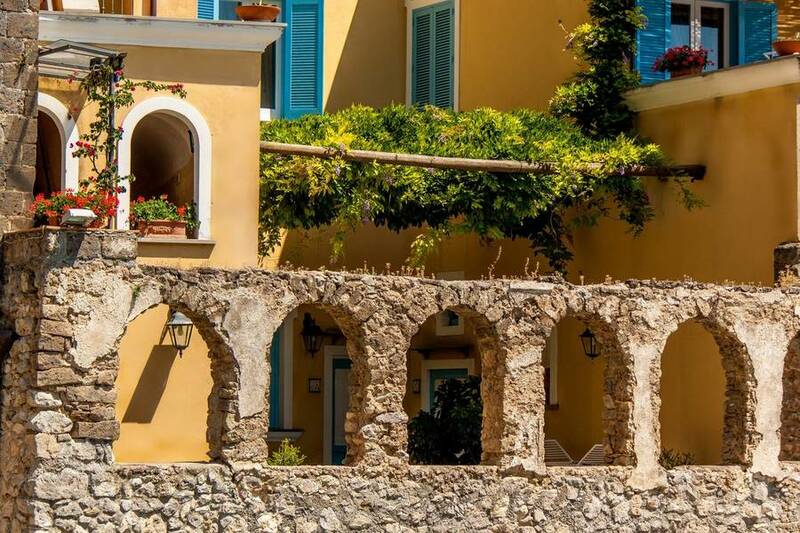 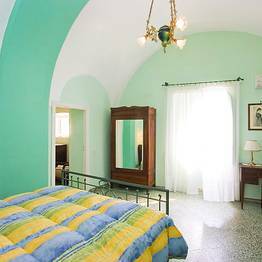 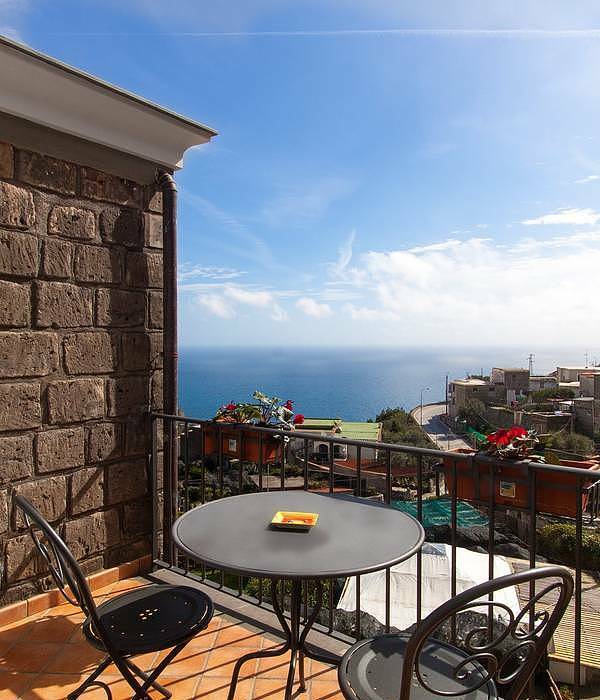 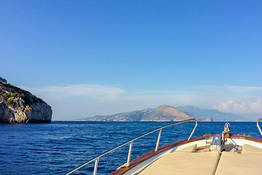 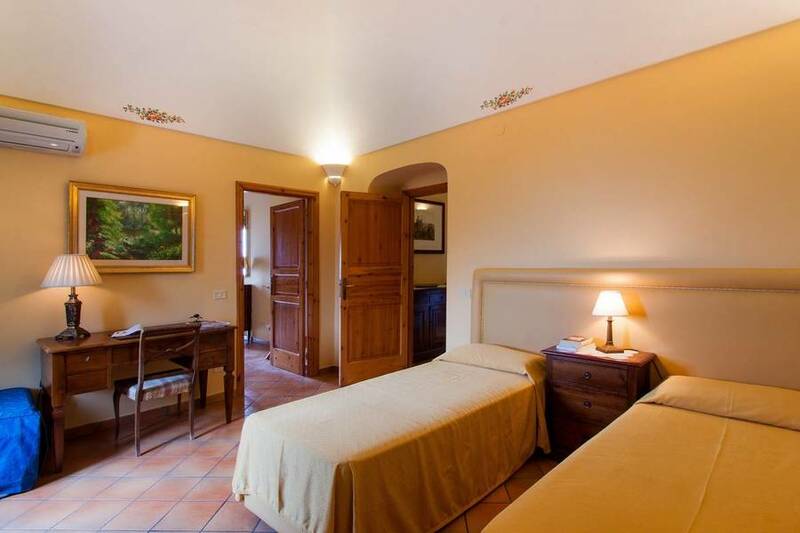 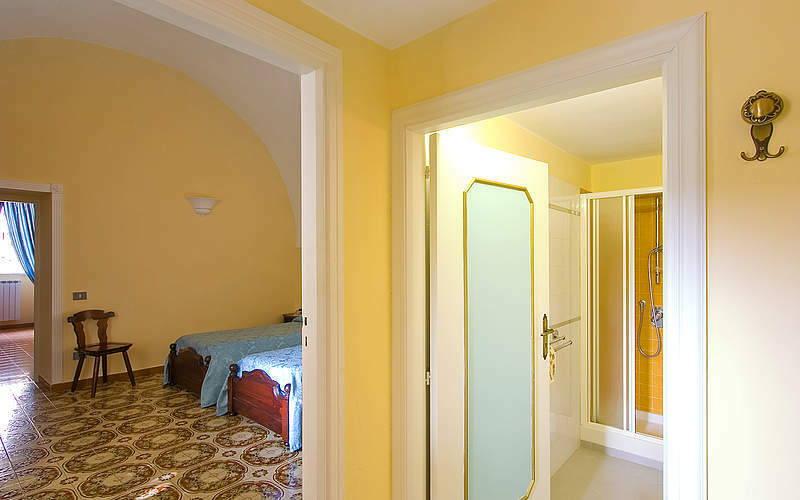 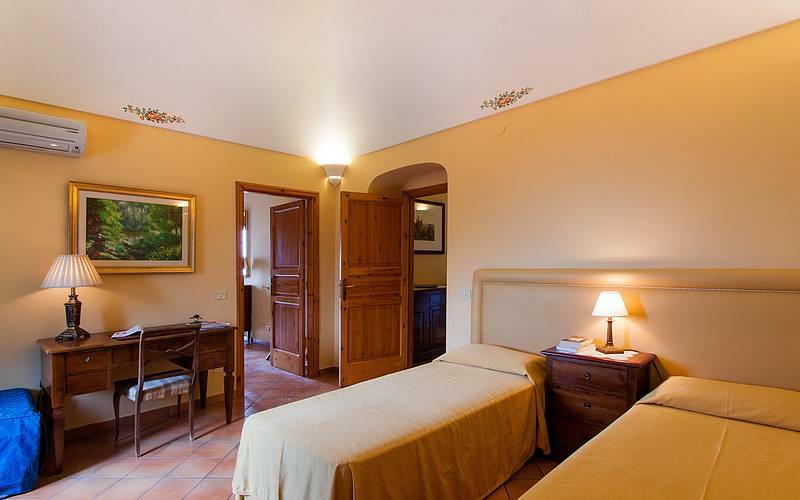 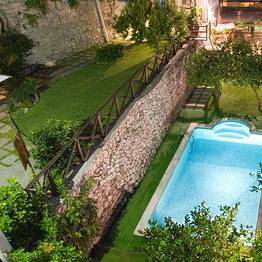 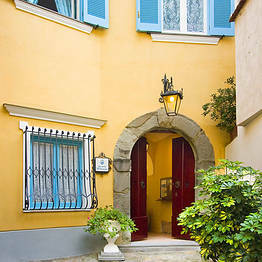 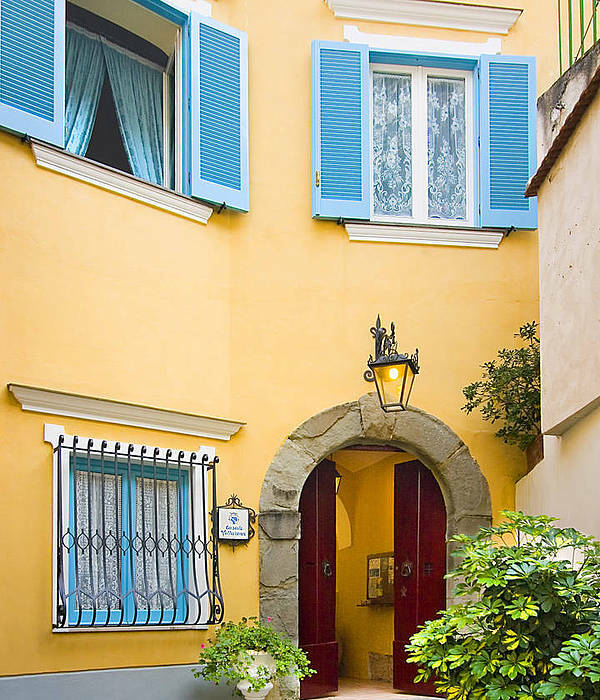 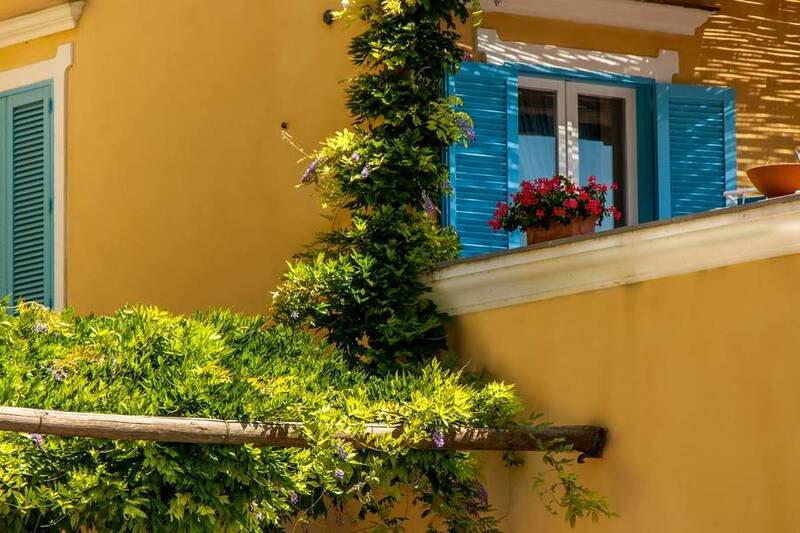 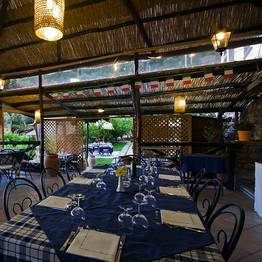 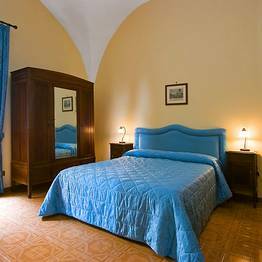 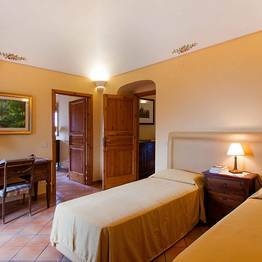 Book Relais Villarena on SorrentoInsider now with no additional booking fees.